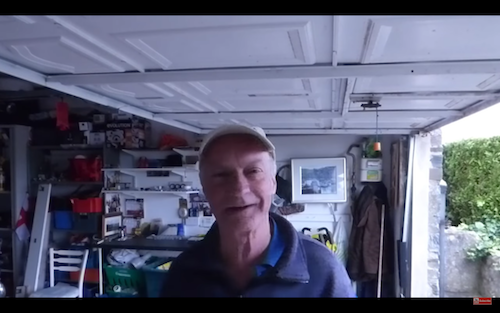 Alfred on YouTube! 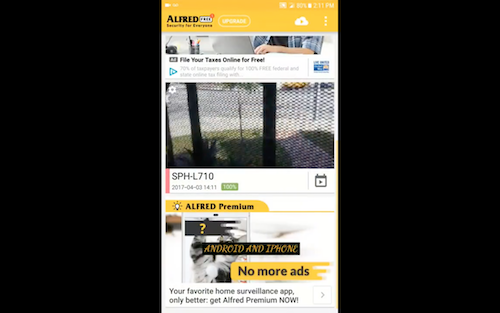 - From the Team - Alfred Center | get the most out of the best home security app! OLA ANDROIDES, AQUI LES TRAIGO ESTE CORTO VIDEO TUTORIAL DE COMO PODER COVERTIR SU ANTIGUO DISPOSITIVO ANDROID EN UN CÁMARA DE VIGILANCIA WIFI. Aproveite seu aparelho antigo e transforme-o em uma câmera de vigilância sem fio. Funciona em qualquer Android e só precisa de uma conexão de internet. Assim você pode monitorar sua casa em qualquer lugar do mundo. This is an awesome app I found. 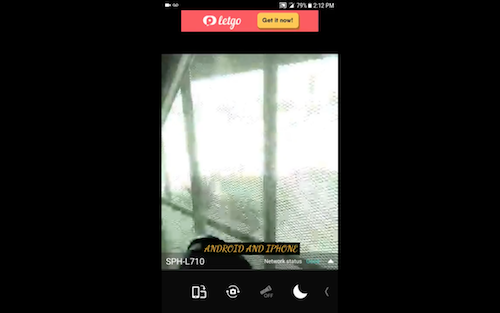 It lets you use multiple old cell phone cameras as ip cams and you can view them anywhere. 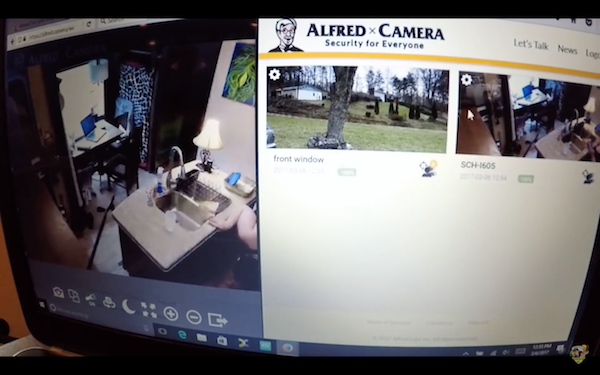 Great for a nanny cam, pet cam, Security cam!! Has NIGHT VISION, motion detection, turn on the Flash-Light!!! Record video! 2 way talk! The paid version removes ads. Quick video on how to re-purpose and old mobile device, be it an old cell phone or tablet and use it as a security camera that can be viewed remotely over WiFi or 4g service. Hello! What’s up there Youtube again? 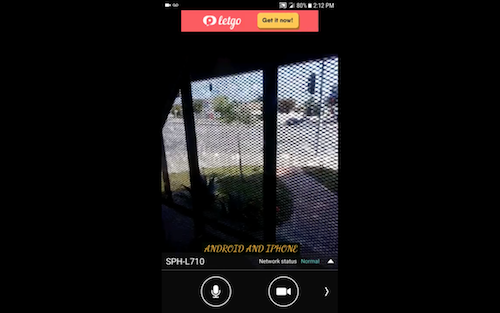 I wanna share this video about this free home security app. There are quite a few out there. I’ve tried a lot of them but I keep coming back to this one. It’s one of the best ones I’ve seen yet. All you need to do is you need to have two phones or maybe more. If you have working phones that you’re not using anymore, they can be used as security cameras. I’ve already had mine set up, so I’m gonna test it right now. Let me open up the app here. The top one here is the phone I placed. I’m gonna walk right in front of it. Right now it’s in standby mode, but when I walk in front of it, it should turn on. I should get a notification. I did. If I go up here to the notification bar, It says Motion Detected, so it’s working. If I play the video, that’s me walking in front of the Camera here. I can experiment with Camera locations. You get notifications straight to your phone. They can be uploaded to Facebook and also other sites as well. You can use more than one phone, but I don’t have one hooked up right now. What you need to do is download the app and sign in to your Google account on both phones. You can use one for Camera and one for Viewer. You can get your notifications here. That’s your Moments. You can also save it to your phone as well. The sensitivity can be set as high, medium, or low. It’s got a really good rating of 4.4. You can look it up on Google Play. They’ve got quite a few of these apps like this, but I like this one the best. It does exactly what it says. The picture quality is not HD unless you upgrade. If you hit the button upgrade, you get better quality. It’s 3,99 a month. It can still be very inexpensive. Also I forgot: you need Internet. You need a phone you use every day, an old phone that still works, or a tablet as well that’s connected to your Google account. You set one phone as Viewer and the other as Camera. You can set it up and turn on Motion Detection. If something moves in front of the Camera, it records. You can also record the sound. Give this app a try, especially if you don’t have the money for an expensive home security system. Everybody should feel safe. The best thing about this is you can check it remotely. If you are at work, Alfred will send alert straight to your phone. It also tells you when the battery is low. You want to make sure your phone is charged. Thank you very much for watching! I’ll see you next time. 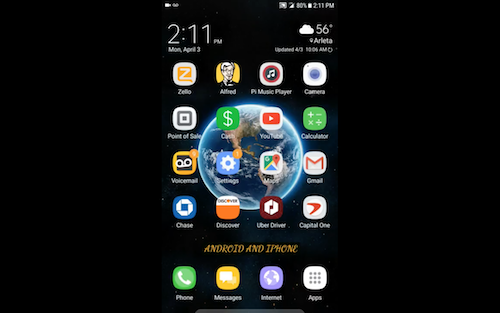 Android Play Store App Stars: If you have home internet service,a working phone with data, and a old smartphone or tablet. 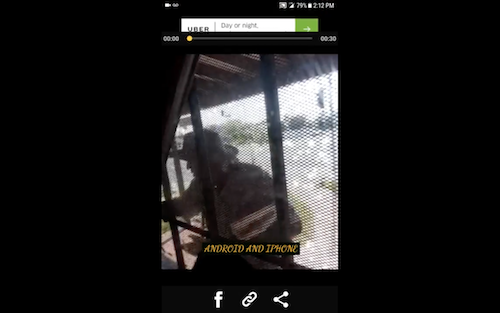 Then you can have a free home security system with this free app watch video to find out how it works. There is a glimpse of her right there. This is the camera indoors. Wave to the camera, Fred. That’s the camera outdoor. 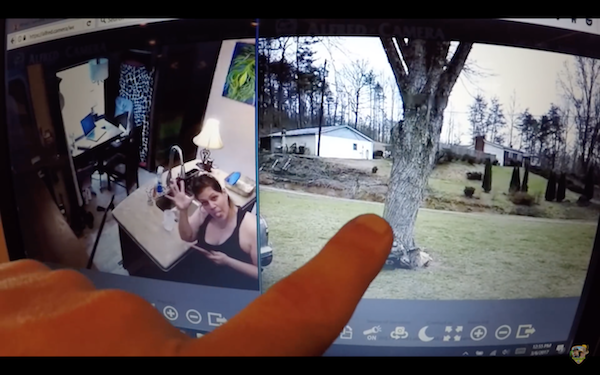 These cameras are really cool because you can do just about everything. You can rotate the screens. This works. I’ve tested it. It’s rock solid. Check it out: the name of it is Alfred Camera. For the app, you can get it from Play Store or Apple. It’s pretty cool, you can actually full screen one of them, and it’s high definition. You can turn the camera light on, you can do the night mode, which makes it super bright at night. You don’t want to do it at daytime. 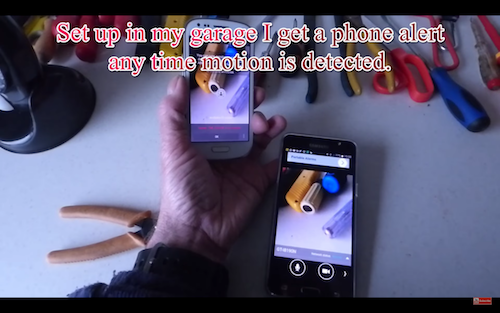 You can take snapshots, you can do Motion Detection. It’s really really really cool and it works. I would think you would have a cell phone lying around, kicking around doing nothing. All you need is a router and an Internet connection. It’s really easy. You can watch it on the computer screen, too. This is the kitchen camera right here. 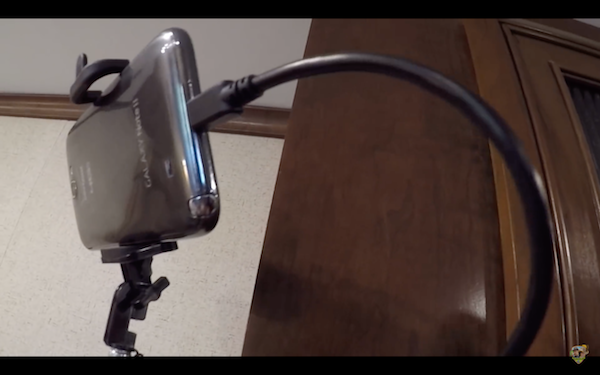 I have it on a cheap 3-dollar little stand, a little selfie stick. I actually just wire-taped it to here for now, and I plugged the USB in to direct power. It works great, no problem at all. 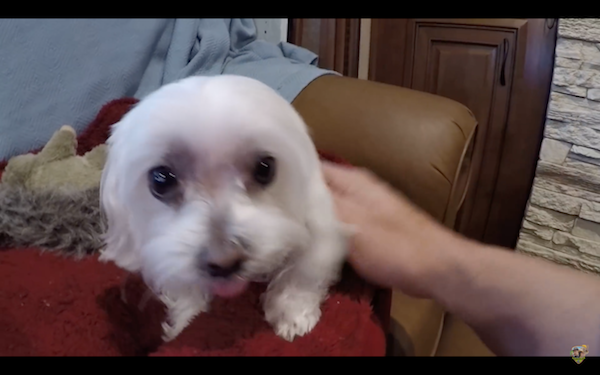 If you’re paranoid like me, you want to watch your pets, cats, dogs, whatever you have, you can do it from your computer. I wouldn’t be doing this video if I didn’t think the software was good. When something works, it’s reliable. That’s the thing. I know some people don’t like this techy stuff, but this is something worth showing to you guys. It works really well. The free version has ads here and there, but you can still use it. The free version is not high-definition. You have to pay for it. It’s 3.99 a month. It’s really cheap. I recommend getting it. I do recommend trying it first. Finally an app that works. It turns your phones into security cameras. It’s really hard to find something something that works these days. When you do, you stick with it. That’s why we have all these phones as cameras for our little babies! 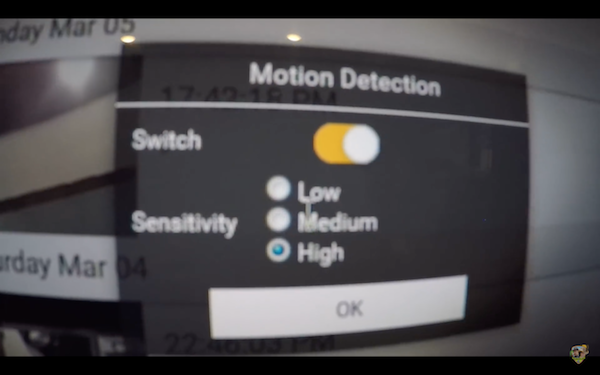 It detects motion, and you get the videos. For the settings, you have high, medium, and low. You can switch it on and off. Another cool feature is you can actually talk into it, so it’s an intercom, too. 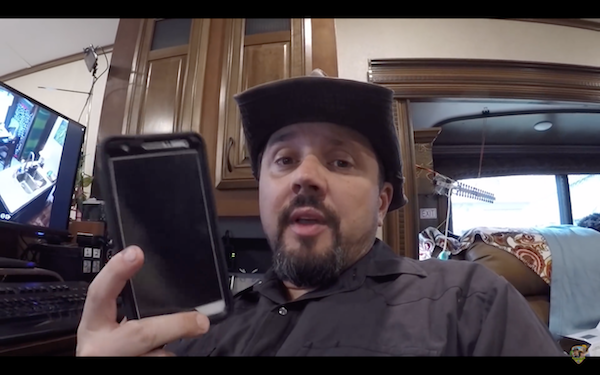 You can be away from your RV in a different country or state, hold this and you can talk back and forth to each individual phone. Wherever they are in the room, you can talk to them like an intercom. I’m thinking about getting a mic or a speaker so people can hear me really loud. I think it’s gonna be a really useful tool. 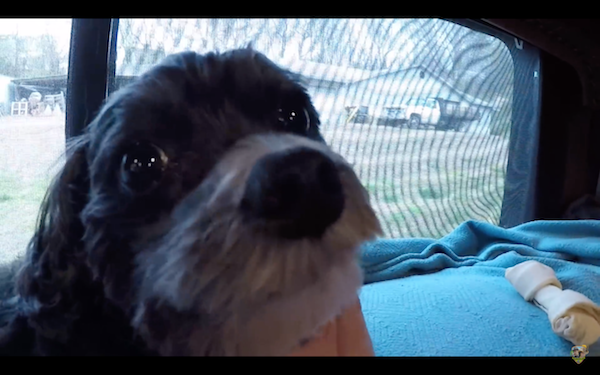 With all that said, I’m actually going to put up another camera into another window to get the view from the other side of the RV. I just think it’s a cool thing, so I’m gonna play around with it. It’s cool because whenever you come across a used phone, or a family member has one, you go “hey, I’ll give you 30 bucks for that phone.” Then you can have a camera that does everything. You can use it as an intercom system. I’m wondering if you can put a microphone on the camera to go out and in. You can get a speaker, so you can talk to each room. For now, it doesn’t really cost us anything. We had the phones, and I put something together. I hope this helps you out. Try it out. Give it a try. You can download the app on your phone, from Play Store or Apple. Like and share the video. Subscribe. It helps us out! 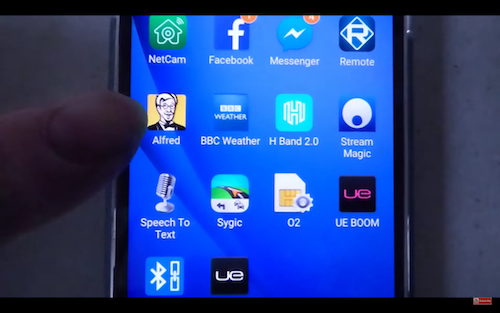 Today I want to talk about this application called Alfred. It’s a home security application. It’s the best one I’ve found so far. You can put this in the cellphone holder in your car, at your window, or at your door. Since my window has a glass, I can put it right there. I can see when the mailman gets there, or when someone is knocking. You can switch between the front camera and the back camera, turn on or turn off the LED light, and it has night vision. It helps you see better at night. It also records videos whenever there is movement. Today the mailman came, so I know when to get the mail or get a package. Hi, welcome everyone. Today I’m going to do something a little unusual for me, that’s a phone app. I’ve just got a new phone from Samsung. I like Android. I still have my old Samsung, but what do you do with it? You tend to just chuck them in the drawer, but I’ve found a good use for them. You make make good use of the old camera. It’s an app called Alfred. 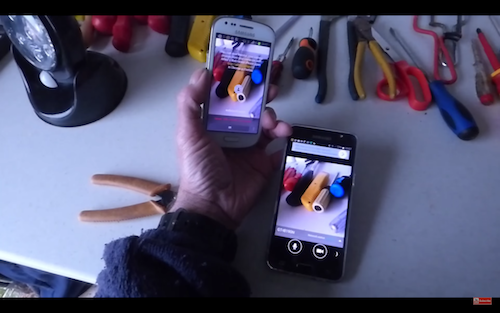 It makes this old phone’s video camera into a transmitter, and your new phone as receiver. While that’s quite good, what makes it exceptional is that it can alert you to any movement. If it gets triggered, you get an alert on your phone. Let’s try the app now. This here is what we have been talking about, Alfred. It is very easy to set up. I’ll show you in action now. I have the camera on my old phone, and the feed goes to the new one. It’s a free app as well. It’s a useful idea mainly because of Motion Detection. That’s the most important thing. That’s a bit of security for nothing. This one also works with iPhone. If you’ve got an old Android and a new iPhone, or if you’ve got a new Android and an old iPhone, both are going to be the same system. It’s a really great idea, something that wastes nothing. That’s it, just something I discovered and I really like it! 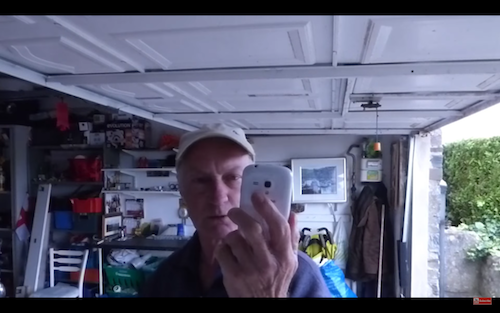 Hello friends, welcome to the video about how to set up your old mobile phone into a CCTV camera. Let me sum up the use cases: monitor your home/farm/office from virtually anywhere in the world using a WiFi or mobile connection. You can use this for video surveillance for a baby, a pet, and an elder at home. Free do-it-yourself home security system. To set up this, there are many free applications available. 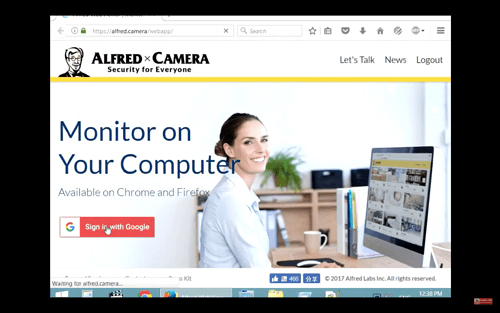 We are going to demonstrate this with Alfred home security camera. There are simple steps you are going to follow. Let’s begin the setup. 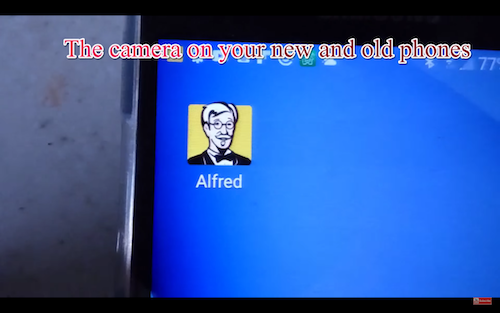 Install Alfred on your new and old mobile phones. Set one as Camera and the other as Viewer. Log in with the same Gmail account both on Viewer and Camera to establish connection. Let’s take the Camera and place it somewhere. 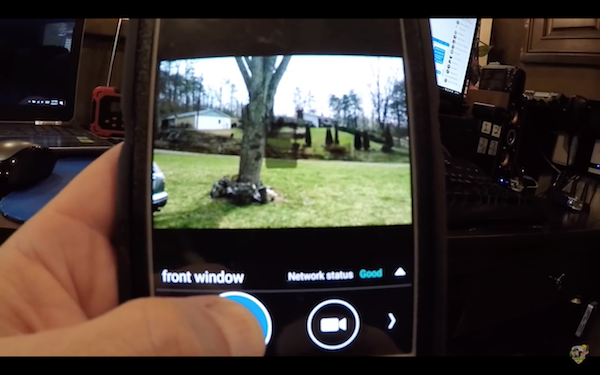 Now I am able to view the live feed from the Camera Phone on the Viewer Phone. Again, you have to log in with the same Gmail account to view the Camera. You can set up multiple Cameras in different locations and view them as per your requirement. I have no idea how to do that, but I think it’s a good idea to get anything done to the right place at the right time.